“Off-piste” skiers—those skiing outside ski area boundaries—may employ snowmobiles, helicopters or snowcats to deliver them to the top of a slope. Back-country skiers may use specialized equipment with a free-heel mode for hiking up slopes and a locked-heel mode for descents. Downhill skiing technique focuses on the use of turns to smoothly turn the skis from one direction to another. Additionally, the skier can use the same techniques to turn the ski away from the direction of movement, generating skidding forces between the skis and snow which further control the speed of the descent. Good technique results in a flowing motion from one descent angle to another one, adjusting the angle as needed to match changes in the steepness of the run. This looks more like a single series of S’s than turns followed by straight sections. Modern alpine skis are shaped to enable carve turning, and have evolved significantly since the 1980’s, with variants such as powder skis, freestyle skis, all-mountain skis, kid’s skis and more. Powder skis are usually used when there is a large amount of fresh snow, as the shape of a powder ski is wide allowing the ski to float on top of the snow compared to a normal downhill ski which would most likely sink into the snow. Freestyle skis are used by skiers who ski terrain parks. These skis are meant to help a skier who skis jumps, rails, and other features placed throughout the terrain park. Freestyle skis are usually fully symmetric, meaning they are the same dimensions from the tip of the ski to the backside of the ski. 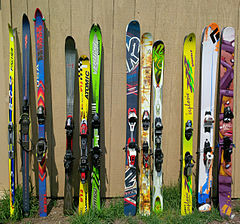 All-mountain skis are the most common type of ski, and tend to be used as a typical alpine ski. All-mountain skis are built to do a little bit of everything; they can be used in fresh snow (powder) or used when skiing groomers. Slalom race skis, usually referred to as race skis are short, narrow skis, which tend to be stiffer because they are meant for those who want to go fast as well as make quick sharp turns. The binding is a device used to connect the skier’s boot to the ski. The purpose of the binding is to allow the skier to stay connected to the ski, but if the skier falls the binding can safely release them from the ski to prevent injury. There are two types of bindings: the heel and toe system (step in) and the plate system binding. Ski boots are one of the most important accessories to skiing. They connect the skier to the skis, allowing them full control over the ski. When ski boots first came about they were made of leather and laces were used. The leather ski boots started off as low cut, but gradually became taller as injuries became more common allowing for more ankle support. Eventually the tied laces were replaced with buckles and the leather boots were replaced with plastic. This allowed the bindings to be much more closely matched to the fit of the boot, and offer dramatically improved performance. The new plastic model contained two parts of the boots: inner boot and outer shell. The inner part of the boot (also called the liner) is the cushioning part of the boot and contains a footbed along with cushion to keep a skier’s foot warm and comfortable. The outer shell is the part of the boot that is made of plastic and contains the buckles. Most ski boots contain a strap at shin level to allow for extra strength when tightening the boots. In the United States, there are 4 rating symbols: Easy (green circle), Intermediate (blue square), and Difficult (black diamond), and Experts Only (Double-Black Diamond) Ski trail difficulty is measured by percent slope, not degree angle. A 100% slope is a 45 degree angle. In general, beginner slopes (green circle) are between 6% and 25%. Intermediate slopes (blue square) are between 25% and 40%. Difficult slopes (black diamond) are 40% and up. However, this is just a general “rule of thumb.” Although slope gradient is the primary consideration in assigning a trail difficulty rating, other factors come into play. A trail will be rated by its most difficult part, even if the rest of the trail is easy. Ski resorts assign ratings to their own trails, rating a trail compared only with other trails at that resort. Also considered: width of the trail, sharpest turns, terrain roughness, and whether the resort regularly grooms the trail. In 2014, there were more than 114,000 alpine skiing-related injuries treated in hospitals, doctor’s offices, and emergency rooms. The most common types of ski injuries are those of the knee, head, neck and shoulder area, hands and back. Before skiing an individual should workout and stay in shape to avoid any type of injury. Ski helmets are highly recommended by professionals as well as doctors. Head injuries caused in skiing can lead to death or permanent brain damage. Skiers should know their skill level and should ski the runs that suit their capability. In alpine skiing, for every 1000 people skiing in a day, on average between two and four will require medical attention. Most accidents are the result of user error leading to an isolated fall. Learning how to fall correctly and safely can reduce the risk of injury. ^ “Alpine Skiing”. International Olympic Committee. Retrieved 12 March 2010. ^ a b c d “Alpine skiing Equipment and History – Olympic Sport History”. International Olympic Committee. 15 May 2018. Retrieved 8 March 2019. ^ Sood, Suemedha (22 December 2010). “Where did skiing come from?”. www.bbc.com. Retrieved 8 March 2019. ^ “How to Choose Downhill Skis”. REI. Retrieved 2017-12-12. ^ “Skis – Ski Equipment – Mechanics of Skiing”. www.mechanicsofsport.com. Retrieved 2017-11-16. ^ “Ski Helmets Guide – Ski Equipment – Mechanics of Skiing”. www.mechanicsofsport.com. Retrieved 2017-11-16. ^ a b “Skiing Injury Prevention – OrthoInfo – AAOS”. www.orthoinfo.org. American Academy of Orthopaedic Surgeons. January 2016. Retrieved 8 March 2019. ^ a b Doyle, Mike (May 12, 2017). “Follow These Tips to Stay Safe While Skiing on the Slopes”. ThoughtCo. Retrieved 2017-11-16. ^ “Projected climate change impacts on skiing and snowmobiling: A case study of the United States” (PDF). Global Environmental Change. Retrieved February 3, 2019. ^ “Managing for climate change in the alpine ski sector” (PDF). Elsevier. Retrieved February 3, 2019. ^ “Less snow and a shorter ski season in the Alps” (PDF). European Geosciences Union. Retrieved February 3, 2019.